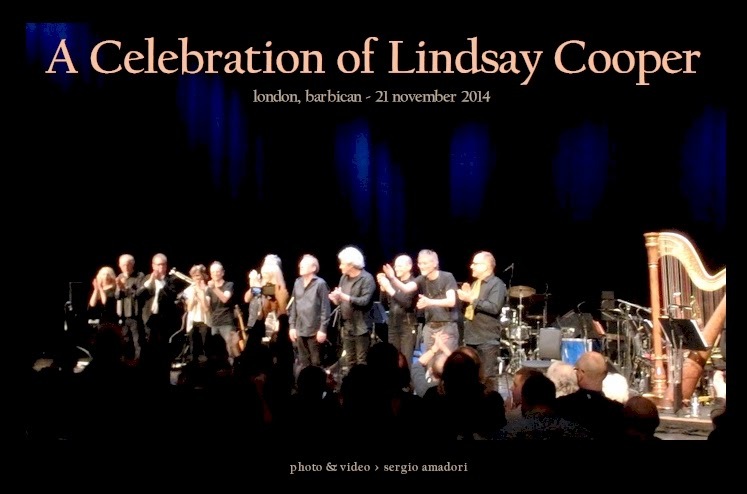 Da questa settimana riposano sparse in un luogo a lei carissimo le ceneri di Lindsay Cooper, così come carissime sono risuonate per migliaia di affezionati le sue musiche la settimana scorsa, a partire dal concerto di Henry Cow, News from Babel, Music for Films e Oh Moscow al Barbican a Londra. Di questo ci sono cronache e recensioni in AMN Reviews e The Progressive Aspect, gallerie fotografiche in Traverses e una breve sintesi video alla pagina YouTube di photocronista. Un personale ritratto della musicista e dell'amica - Lindsay Cooper: a rebel with applause - è firmato per The Guardian da Sally Potter, che così ricorda i segni del primo apparire della malattia: "I was with her when she first noticed pins and needles in her fingertips and voiced her fear that it heralded every musician’s dread disease. Some years later, her leg suddenly gave way and the diagnosis was confirmed. But Lindsay did not want to be identified with the disease or thought of as a victim, knowing all too well it could come to eclipse her primary identification with music. So she kept going for more than 10 years, touring and composing – living what became virtually a double life. The public self, a dedicated professional, musical rebel, iconoclast and virtuoso; and the private self, an intrepid investigator of illness and health, spirit and matter. Eventually, when it became evident she had lost most of the strength in her fingers, she “came out” as a musician living with MS."